The group arrived near Little Plumpton at around 8.15am on Thursday and blocked the entrance to the site where exploration company Cuadrilla wants to drill four wells and test frack for deep-lying gas. They had locked themselves together with their arms inside metal pipes in a bid to delay work at the site where an access road has now virtually been completed. They were supported by a group of protestors alongside the A583 where a traffic management system is in place. Although the protests have drawn criticism from businesses which support a shale gas industry amid claims of intimidation, local campaigners say they support peaceful action. John Hobson, from Frack Free Lancashire, said: “People come on a daily basis to protest peacefully and on occasion have been met with aggression and that has resulted in tension on both sides. James Nisbet, from the Roseacre Awareness Group, said: “I am here to support the Preston New Road people and the anti-fracking movement across the country. 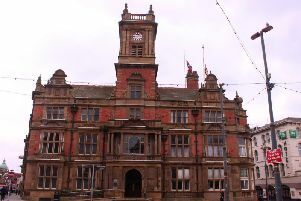 A police spokesman confirmed that five men aged between 23 and 55, all from the Blackpool area and a 51-year-old woman of no fixed address, were arrested on suspicion of offences under Section 14 of the Public Order Act. A sixth man, 53, was reported for summons by officers.